A veggie alternative to the classic Italian dish. 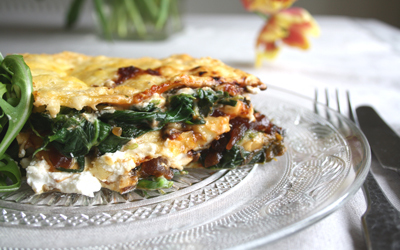 This goats cheese, spinach and caramelised onion lasagne recipe is not only a dish which will get your tastebuds in a frenzy but it’s also super easy and quick to make. Layer up a 15 x 20cm roasting dish with the ingredients. Start with a 1/3 of the tomato sauce, then a 1/3 of the pasta, all the spinach, another 1/3 of the tomato sauce, another 1/3 of the pasta, all the goats cheese, all the chutney, the remaining pasta, the remaining tomato sauce and finally the cheese. Bake for 20 minutes, or until cooked through and bubbling.